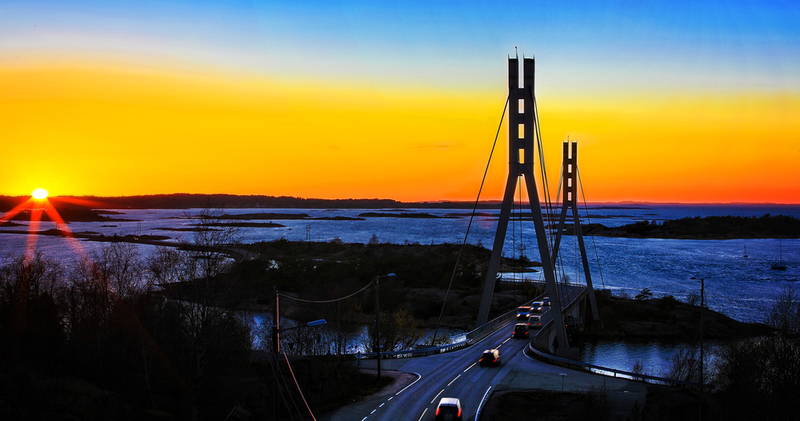 Most people who are fond of Hvaler have a loving relationship with the grand and beautiful sight that meets the eye when driving over the "gateway" to the islands; the Puttesund Bridge. First time visitors who are being served this magical appetizer, ask with a captivated and puzzled face: "Does it get even better than this?" 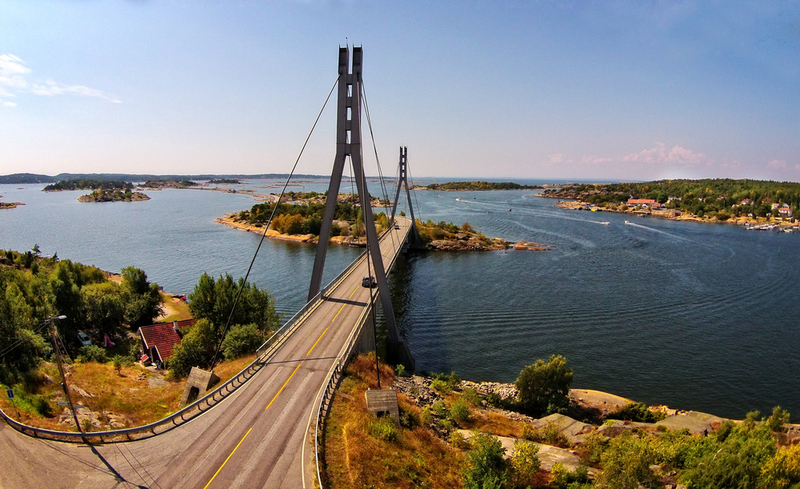 Many feel that the first part after the bridge, where one drives by small islands, some of them only a few centimeters above water, is the best area in the whole Hvaler archipelago. They get so mesmerized sitting in their cars looking at the glistening sea with the many boats, that they just have to stop at the nearest islet and get out to study all the islands and the blue sea stretching outward as far as the eye can see. Not many municipalities in Norway are able to greet their visitors in such a spectacular way. Welcome to Hvaler! Pit-stop at Håholmen. When the evening sun gilds the archipelago, the time has come to replenish the soul. Let yourself be carried away by the beautiful sight of all the islands. Breathe the salty ocean air and feel the gentle breeze gently stroke your face. Treasure the time, nights like this are all too few. Fresh sea foam at Slettevika, Vesterøy - Hvaler. Weather and wind, sun and clouds are everywhere on the globe. But every place has its own palette of colors, which the great unknown artist paints on the firmament with masterful brushstrokes. Dramatic visual compostions appear at sunrise and sunset. The art can be seen for a few minutes in nature's own gallery, only to disappear into new wonderful pictures, until darkness or daylight erases all shades. The morning light over the archipelago before the bird life and human swarm awaken, is incomparable. The sunrise at 4am slide across lead-grey rocks like blazing heat from a furnace. A few hours later the dazzling daylight shows a solidified landscape of lava rocks, granites and syenite which are the geological Østfold. The summer does not go on forever, but some summer nights can give a sense of extended time, like when the sun is still shining at 10 pm. In summer the sun smiles down on the Fredrikstad and Hvaler coast, the rocks are hot, the sea is inviting and the nights are light. Fredrikstad's and Hvaler's harbors are teeming with life. People enjoy them selvselves at the many outdoors restaurants, they shop, boat and happy holiday people are everywhere. Lots of people visit the many ongoing festivals - jazz, blues, rock or classical chamber music. There are many activities to see and to take part in during the few, but beautiful summer weeks so it is important they enjoy them to the fullest. Some prefer to sail among the islands and reefs, others to swim in fresh, salty water as often as they can. Some fish in the outer Oslo fjord, and a lot of us love delicious barbeque food at the cabin. Kids fish for beach crabs, fresh shrimp are enjoyed on hot rocks in the sunset and mackerel is fished at dawn. Summer in Fredrikstad and Hvaler is beautiful around the clock! Outside of Papperhavn port in Hvaler, we experienced an enchanting experience at sunset on Pentecost Eve last year. As we gaze on the sunset which is falling behind Lyngholmen a trumpet suddenly appears on an islet further away. Beautiful music fills the magical surroundings, all accompanied by fantastic sunset and the archipelago's birdlife. Just as suddenly as trumpeter appeared on the island, he was gone again. Magical. Fredrikstad and Hvaler's archipelagos are a paradise for kayaking. The thousands of islands, rocks and skerries, many of which are uninhabited, offer endless possibilities for sea kayaking adventures for both novices and more experienced paddlers.